In March and April, MOSECON helped raise much needed funds for St Clare, attending the hospice’s Spring Ball and running the Berlin Half Marathon in honour of Stan Wright. Further donations are more than welcome! This holiday season, MOSECON wishes (and asks you) to support the St Clare Hospice in West-Essex, UK, with a donation. We have chosen this charity in honour of its first employee, Stan Wright. 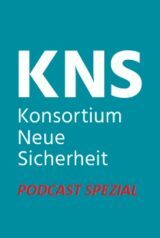 This KNS Podcast is a very special special with MOSECON’s Director of Operations Nik Wright, who’s giving his British perspective on German security. In English with a German translation.